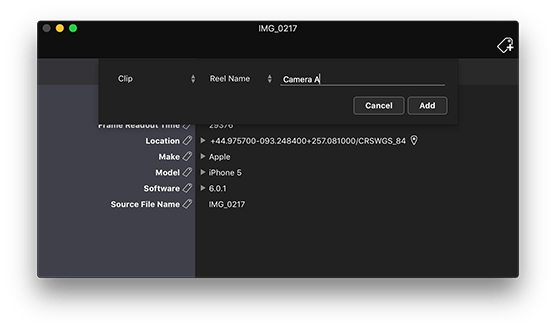 Output QuickTime movies for Adobe Premiere Pro and Apple Final Cut Pro, FCPX, and iMovie. Write DNxHD/HR OPAtom or OP1a MXFs for Avid Media Composer. 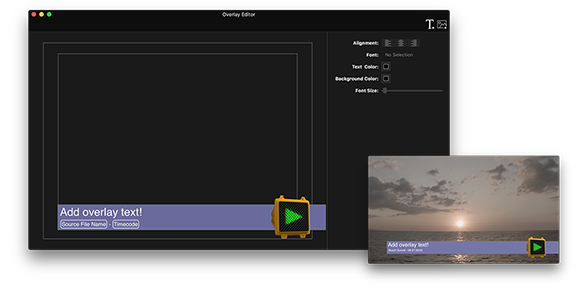 Use the overlay editor to layout custom overlays to be composited on top of your video. Import images with alpha channels to apply complex bugs or watermarks. Layout custom formatted text, including metadata values from the source media. Use the overlay tool to burn-in timecode, reelnames, shoot dates, media names, etc. EditReady is designed to use all the power available on a modern Mac. It can even leverage the power of your graphics card for fast image processing. EditReady allows you to view and edit all of the metadata contained within your file - this may include location data, camera settings, and diagnostic information. You can even use metadata to automatically rename files, or burn it into overlays. 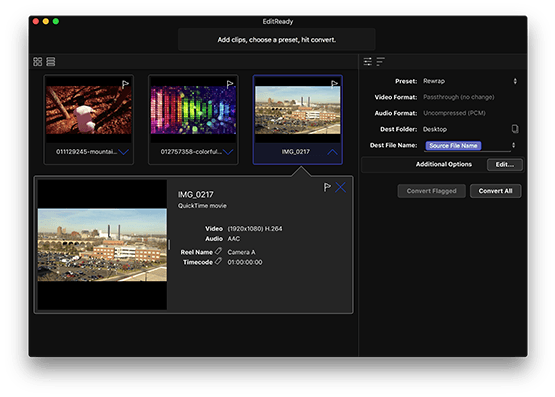 EditReady allows you to screen your camera original media files before you transcode them. Apply a LUT to preview your LOG media in video, or with a specific predetermined look. Or check your previewed clip in ScopeBox via our integrated ScopeLink connection. You can even set in and out points to limit your transcodes to only the part of the clip you need. EditReady is a modern transcoding and rewrap application by the same people who brought you ClipWrap. We took everything we learned from years of AVCHD and HDV parsing, and made a fast, robust tool for all major camera formats. EditReady is designed with video professionals in mind. Rather than overwhelming you with hundreds of choices you'll never use, EditReady is tailored to the formats you use every day - convert any MXF, M2T (HDV), MTS (AVCHD), Blackmagic RAW, or QuickTime to ProRes, DNxHD/HR and H.264. Whether you're working with MXF from a camera like the Samsung NX1 (H.265), Canon C300 or Sony F5 or FS7 (XAVC), an AVCHD camera like a Panasonic HDC-TM900 or Sony NX5U, an HDV camera like a Sony HVR-Z7U, or an MP4 camera like a GoPro HERO5, DJI Phantom, Panasonic GH5, or Canon 5d Mark IV, EditReady has you covered. 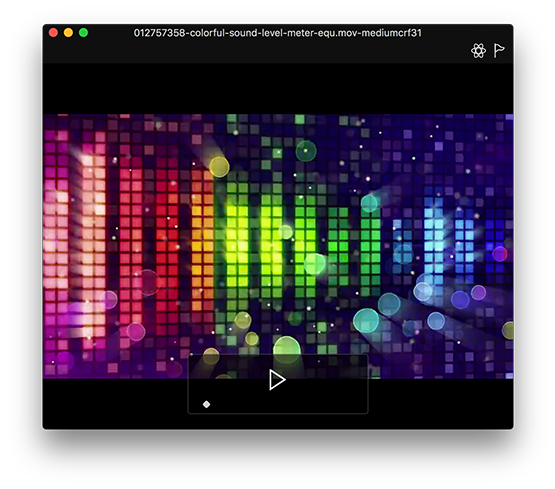 Mac users know that just viewing clips with QuickTime X isn't always as easy as we'd like. EditReady provides a simple player to view your content, even if it's in a legacy format. Many other transcoding apps on the market use a reverse engineered implementation of Apple ProRes. By leveraging the official Apple version, EditReady avoids compatibility issues. 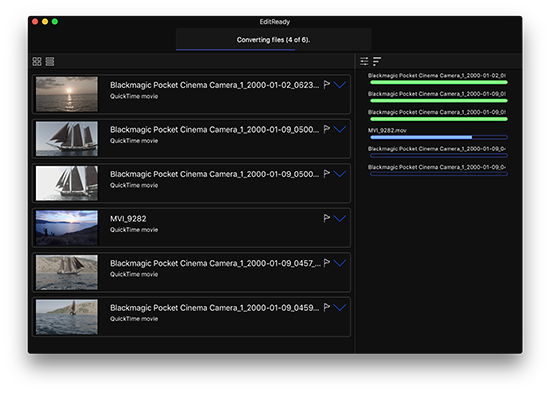 You can run simultaneous batches within the EditReady interface, allowing you to simultaneously generate proxy media and online material, or convert footage from different cameras.